Summit wants to hear from you – Please complete the family survey! 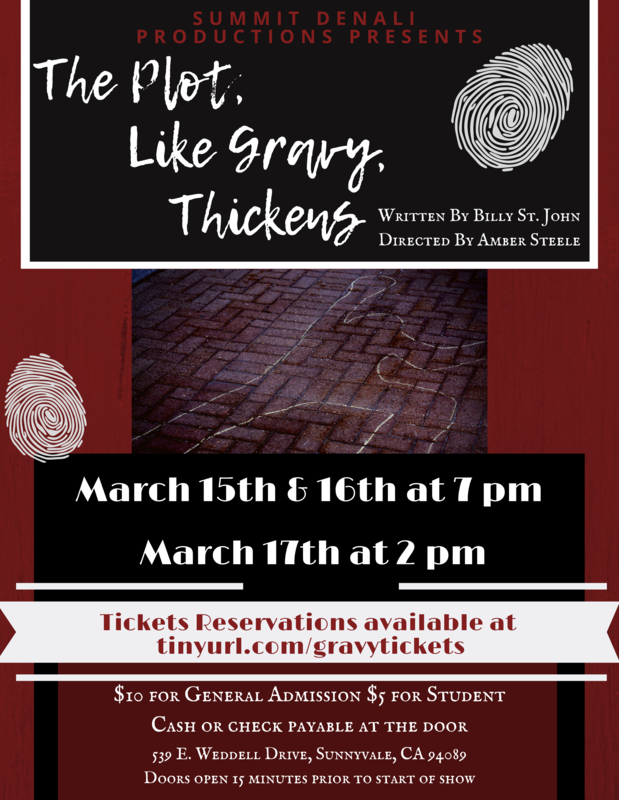 Summit Denali Productions presents The Plot, Like Gravy, Thickens a murder mystery comedy by Billy St. John. The show is March 15th and 16th at 7 pm and March 17th at 2 pm at the middle school campus. Tickets are $10 for adult/general and $5 for student/child. Ticket reservations can be made at tinyurl.com/gravytickets. All tickets will be paid for at the door in check or cash. Doors will open 15 minutes prior to the show starting. Come enjoy the show! We promise to make it a night…. to DIE for! The Middle School Faculty Professional Development (PD) Day will be a half day of school for students in grades 6-8. School will be in session from 8:15-12:10pm that day and all middle school students should be picked up between 12:10 and 12:30pm. It will continue to be a full school day for High School students. Lunch service will be available as normal. We’re making progress, but we still need more. Right now we have 12 drivers signed up. These trips can only happen with your driving support! Please sign up here. Thank You! Parents are requested to pay for their own accommodations, but if that is a hardship, please contact Mr. Bock for reimbursement. Please arrange that in advance. If you plan to stay at the same hotel as the students, you will need to be volunteer screened (you need a background check and TB test). If you stay at a different hotel nearby, then you do not need the background check and TB test. The students will be staying at the Days Inn in Fullerton. Right now we only have 9 drivers signed up and we usually need 20-25 drivers. These trips can only happen with your driving support! Please sign up here. Thank You! We’re making progress but we still need more. Right now we only have 13 drivers signed up and we usually need 20-25 drivers. These trips can only happen with your driving support! Please sign up here. Thank you! Come out and support the first Denali Baseball Team! The Middle School Study Trips will all happen on Friday, May 17th and we’ll need lots of drivers to make these trips happen. We understand that when you offer to drive you are volunteering your time and resources and we want you to know that it is very much appreciated! We also know that some of you were frustrated with your experience volunteering as drivers for the camping trip earlier this year. While it is impossible to promise an entirely smooth process, we are starting early so that the driver approvals can happen well before the date of the trips. We hope that you’ll be willing to volunteer again! Summit invites you to participate in the Spring 2019 Summit Public Schools Community Survey. Your opinions matter! Every year, thousands of Summit families complete surveys like this one, and that data generates tons of insights about how to make their children’s schools better. Your voice will help Summit’s leaders make the right decisions for your child, now and in the future. The survey consists of a series of multiple-choice questions plus an open-ended type question at the end where you can write in your response. The survey should only take you about 20 minutes to complete. Before the open-ended question, there are a few demographic questions. These questions are optional and are used only by us to give context to our data findings. All of your answers are secure and kept confidential. We do not ask your name and there is no way for us to identify your specific answers nor are we interested in your individual answers. Rather we are interested in the views of parents across the entire Summit community. We encourage you to talk with your children and their teachers about your ideas for using technology effectively for learning. By being part of the Summit Public Schools Community Survey you are sharing your ideas to improve education. Please feel free to encourage your friends and fellow parents to participate.